Our office is located at Brighton Center right across from St. Elizabeth’s Medical Center. Here is the link to Google maps. There are many off-street parking available with a nearby municipal parking lot. Take the Green B Line to Warren Street and Commonwealth Avenue. Walk north to the end of Warren Street. 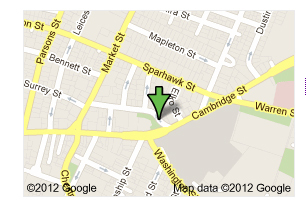 Take a left onto Cambridge Street and walk one block to Henshaw Street. Take a B, C, or D Green Line to Kenmore Square Station, and then take the #57 bus (Watertown Square) or #65 (Brighton Center) to St. Elizabeth’s. The bus stops directly across from the Medical Center near Henshaw Street. Take the Red Line to Harvard Square, and then take the #86 (Cleveland Circle) bus. Get off at the corner of Washington and Market Streets in Brighton Center and walk two blocks east on Washington Street to Henshaw Street. #57 (Watertown Square), #86 (Cleveland Circle), and #65 (Brighton Center).